We didn't get much snow before it changed to sleet and freezing rain so it doesn't look like much but it's a hard frozen crust. 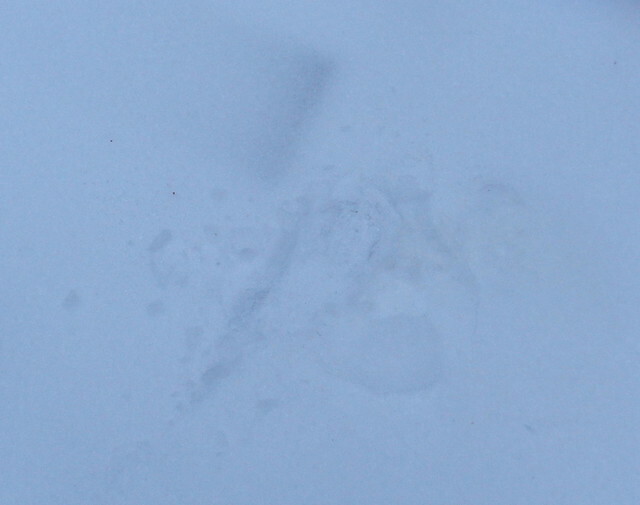 The shot above shows where I walked without leaving a boot print and below shows where I finally did sink down. If anyone has driven up my road yet they haven't left tracks. This is the type of situation that is hard because it doesn't look like much but it's frozen solid. 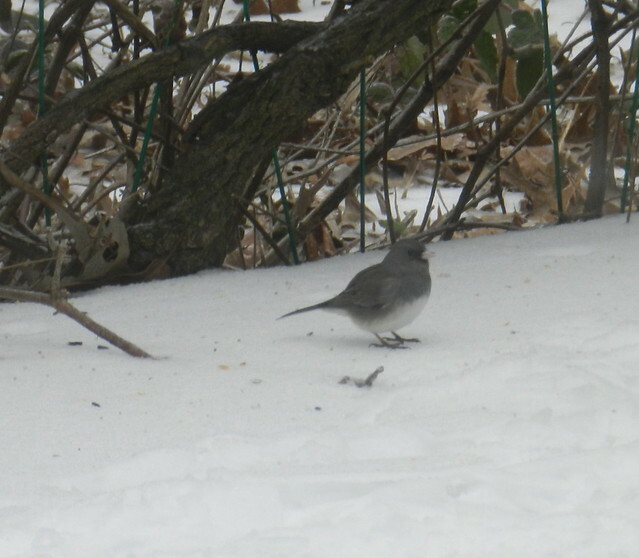 I only feed the birds in bad weather because I have so much naturally grown food in my overgrown yard. 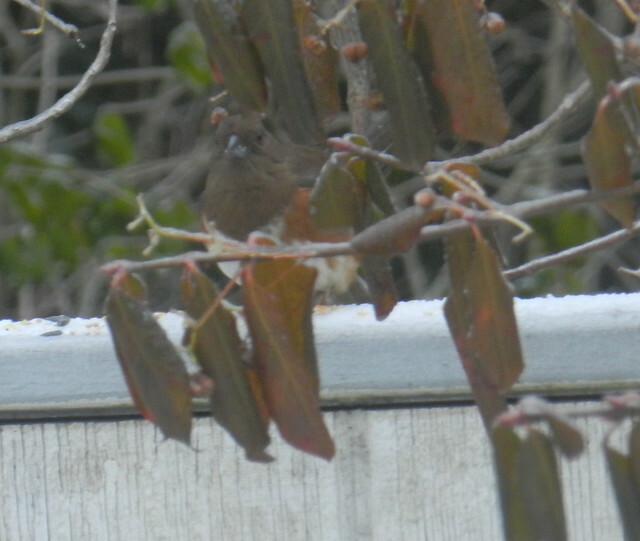 Above is a female rufous sided towhee and below a titmouse. Instead of getting my old bird feeders out of my storage room, I used my deck wall as a feeding station and put out a few tins of dry food. Below is a male rufous sided towhee. 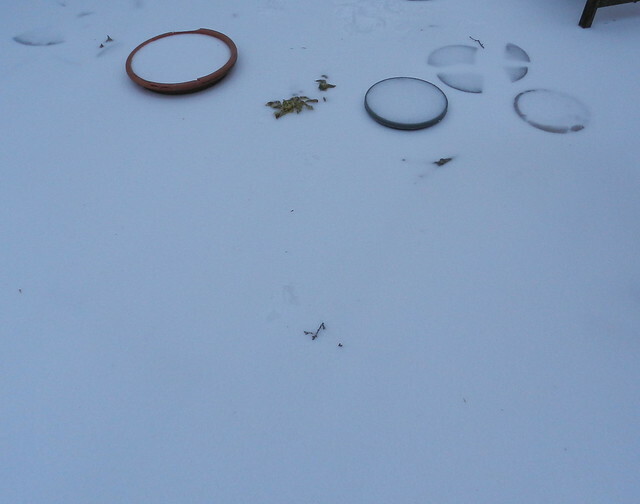 Since the birds live in my overgrown yard and come to my deck for fresh water, they immediately find the food I put out for them when it's extra cold, snowy or icy. 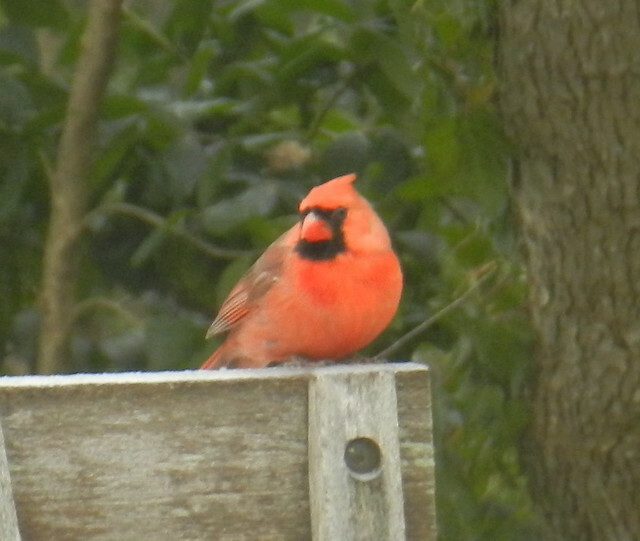 Above is a male cardinal and below is a junco. This snow and ice needs to go! I am ready for spring and to hear the birds singing again.. 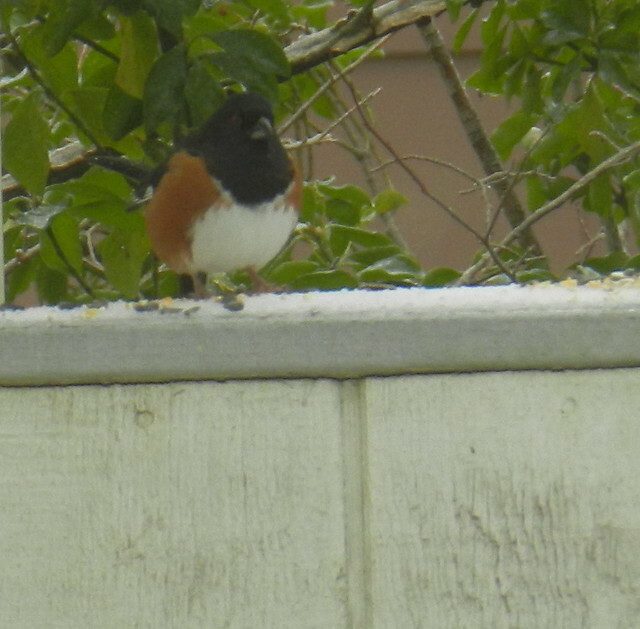 I've been seeing a Towhee lately too, they are cool birds. Stay warm and safe, have a happy day! Wonderful winter shots. Love those birds. Lovely wintry shots and gorgeous bird photos ~ you must have a wonderful back yard for the animals and birds! We just had much of the same kind of weather. Can't wait for spring! 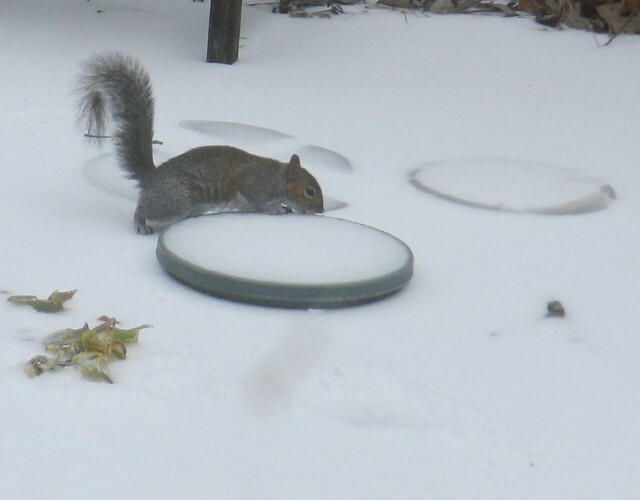 The squirrel is too cute. For us we've been having so much of a good thing. April weather in February. 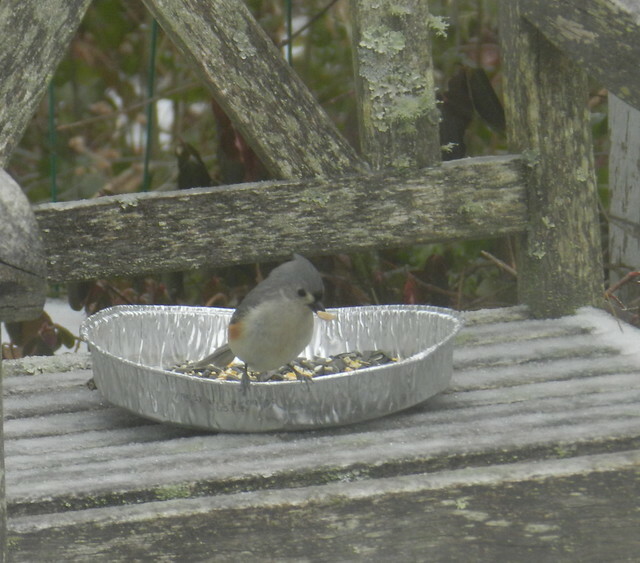 stay safe… freezing rain can really be dangerous… I ;love your birdie visitors! Ice and packed snow is not fun. Hope it warms for you and the birds, soon. Be careful out there; I'm sure that frozen ice under snow would be a recipe for disaster for me; I'd probably fall on my keister or worse. I love the bird feeding station. My daughter feeds birds by scattering seed. She does not have time to wash feeders. It seems to work for her and for her birds. Its tough to manage this snow. Good that you are feeding the birds during this time. I enjoy your birds. So glad you feed them so nicely. You have lots of birds in that backyard of yours Carver! Hope the snow soon goes and it is warm there. Beautiful birds, you take good care of them and then they pose nicely for a photo. Nice shots. But it's no fun out on the ice!